One of the reasons I think our imaginations are in such a poor state in 2018 is that we spend so much time looking down. Look around you. On the bus, on the train, in the street. Our eyes are locked down to our screens, our attention elsewhere. So I want to share with me something that I find really helps. “A watering can, a harrow left in the fields, a dog in the sun, an ugly church yard – all these things can become a receptacle of my revelation. Each of these objects and thousands of other similar ones, which one normally merely glances over with indifference can, for me personally, at any one moment – but in no way controlled by myself – take on an exalted and stirring character”. Yet the smartphone in our pocket often intervenes, putting prophylactic layers between ourselves and experiencing the moment we’re in. As Dr Larry Rosen and Adam Gazzaley put it in the brilliant book ‘The Distracted Mind: Ancient Brains in a High-Tech World’, smartphone technologies “leave little time for reflection, deep thinking, or even just sitting back and letting our random thoughts drive us to places we might not have gone while immersed in directed thinking”. When I’m out, walking the dog, walking in the woods, I like to look up. Sounds kind of obvious, but looking up in a forest is amazing. It’s another world. I first got the idea when I did an Earth Walk, a brilliant activity developed by Earth Education, where one of the activities is to walk, in silence, in a forest, looking down into a mirror that you are carrying. It allows you to see and experience that wood in a way you never have before. It’s amazing. Try it. When you look up you’ll see such beautiful patterns, stunning patterns of light through the leaves. In Spring, a beech forest is like a stained glass dome, a study in green. In winter, the silhouettes of trees are just as beautiful. You might even see what Robert MacFarlane (one of the most fascinating people to follow on Twitter) recently called ‘crown shyness’, a phenomenon beautifully captured in this photo from Kottke.org. Yet all too often, our response is to take a photo to put on social media, on Facebook, on Twitter, to share, rather than allowing what we are seeing to inspire us to create a poem, a doodle, a haiku. Taking a photo to put on Twitter requires about 20 seconds of our attention, creating a poem takes a lot more. As our attention spans fragment, the phone option becomes more predominant – that little hit of dopamine, that empty call out for validation. But this short blog is nothing more than a plea to say next time you’re out, in the woods, in the park, look up. Look up and lose yourself. Don’t reach for your phone, reach for your imagination, your creativity, your inner Hugo von Hofmannsthal. And if you can find another blog today that suggests you do that, I’d be very impressed. Here’s a taste of what you might see (from the occasions when I did the opposite of what I’ve just advised you and took photos…). 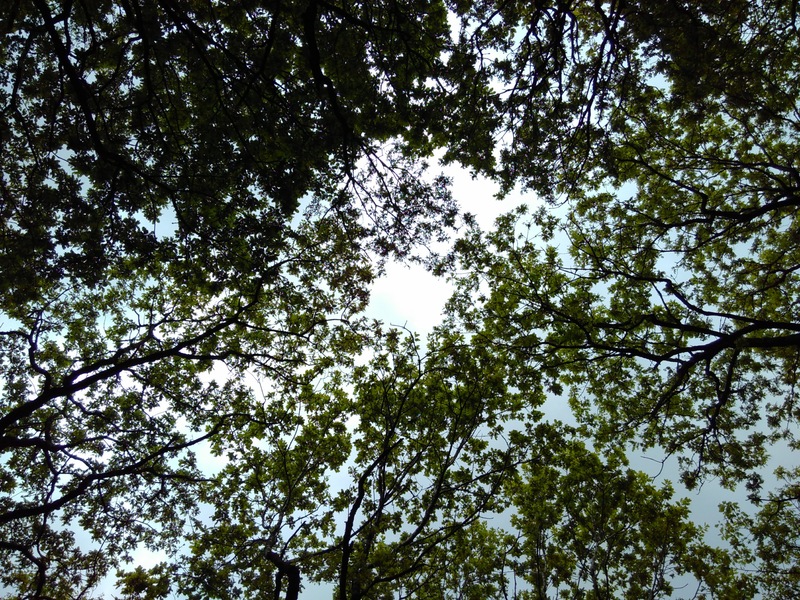 I take the slightly lazier route of actually lying under a tree when the moment takes me – and staring up at those beautiful leaves or the silhouette – it is always a masterclass in the wonders of nature. Thank you for this little window into a tree today – I might have to make one of your images my screensaver!! In terms of our continual use of the mobile – have you read the work of James Katz – a comms professor from the states who coined the term ‘Apparetgeist’ – describing the wearing of the phone / technology and the increasing inability to separate self and tech. Horrifying really – I am all for tech sabbaticals…although maybe not today! Thanks. I will check him out. Yes, yours is a far more restful strategy. I am generally trying to keep up with my dog at the time, so it’s less of an option. Will check out Katz, sounds like my kind of guy. Did a great interview last night with Dr. Larry Rosen, co-author of ‘The Distracted Mind’, coming soon! Nature tends to communicate through telepathy, which is mostly received in pictures, so if you close your eyes, you may see pictures and you will feel like you are watching a movie. And you can communicate by showing pictures of what you are feeling and thinking. Of course, you can tell the tree anything that you would like it to know. Use your imagination, as this is how Nature communicates with us. I like to find faces in the trees as well. Sometimes there will only be an eye, but sometimes I can find a whole face hidden within the bark. It really does feel easy to communicate when you can see a face staring back at you. And it doesn’t have to be a human face. Sometimes it is the shape of an animal face that I see. your pictures of the trees are wonderfull! An excellent reminder (to look up!). And yes, Robert MacFarlane, along with many others, elevates Twitter and always has something interesting to feed us. Perhaps its a matter of degree and intention. Your post reminded me how I would often tell people that doing filming and taking photos (rather than snaps) would make me look upwards. Having said that, I love taking snaps on my phone. In terms of tree gazing I once saw, and sat, on a type of reclined bench/platform (kind of like a dentist’s chair) on a forest walk in Wales. The purpose was for you to easily get on your back without having to lie on the ground, as looking up can be more of a strain for some I suppose. I’m also reminded of Mary Oliver’s brilliant poem Wild Geese (and how their honk can take you out of yourself and make you look up, out and beyond). Thanks again for a great blog piece.